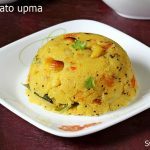 Tomato upma recipe with video – Sharing a quick breakfast recipe of Andhra style tomato rava upma. 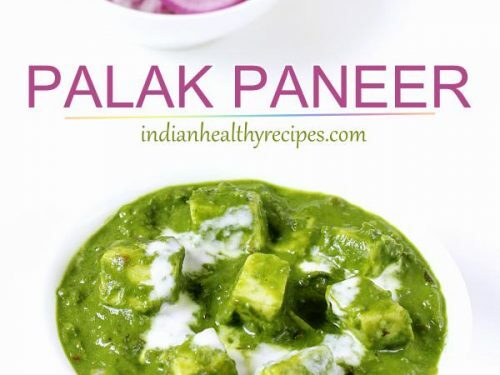 This can also be served for lunch or dinner and takes just 15 minutes to make 2 servings. 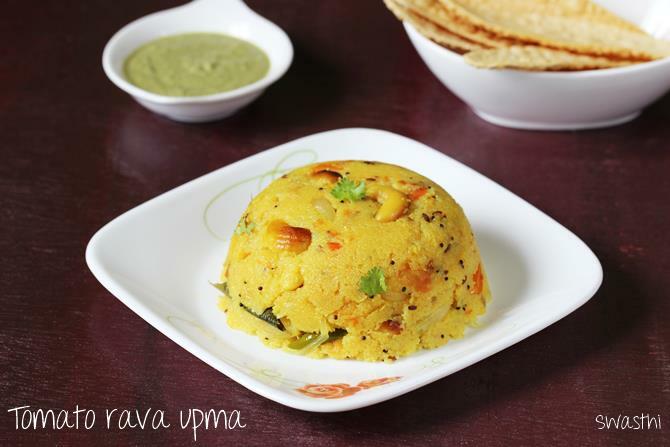 This is almost the same as the South Indian style rava upma just with an addition of ripe tomatoes. 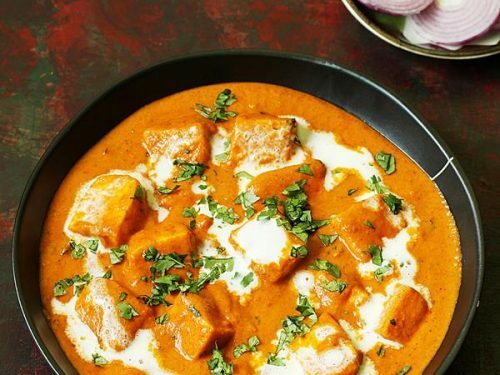 I made this some time ago along with this quick masala tea for my brunch. 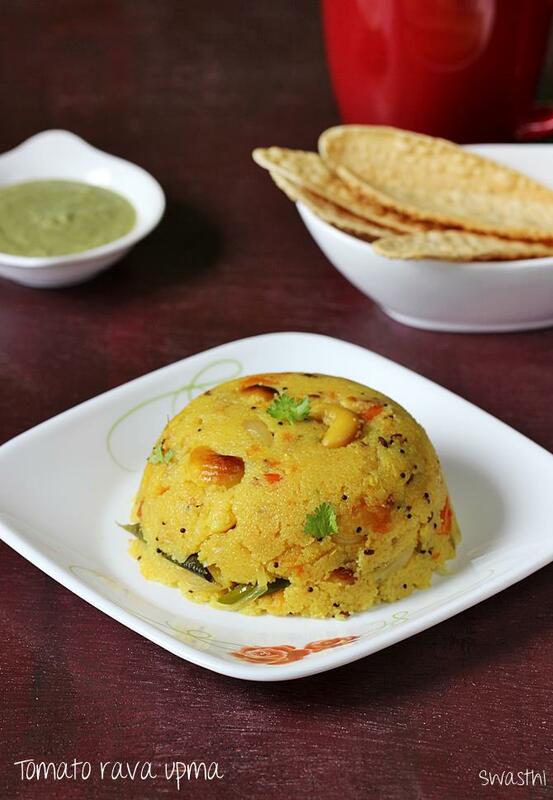 This tomato upma can be served alone or with some pickle, chutney, podi or papad if having for lunch. This tomato upma tastes slightly tangy and hot that comes from the green chilies. This tastes best when served hot or warm. 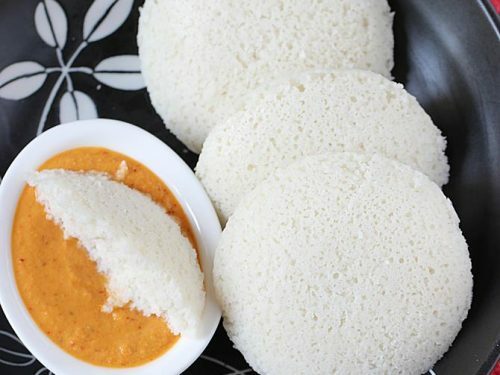 Do note that rava or suji (semolina) is a refined food and must be consumed in moderation for health reasons. 1. 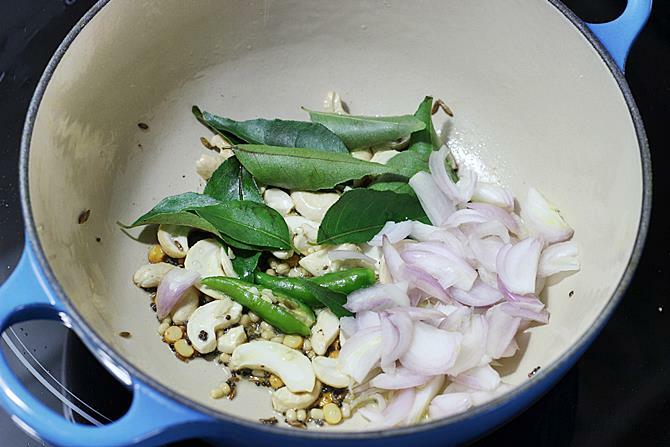 Add rava to a pot and roast on a medium flame until crunchy. 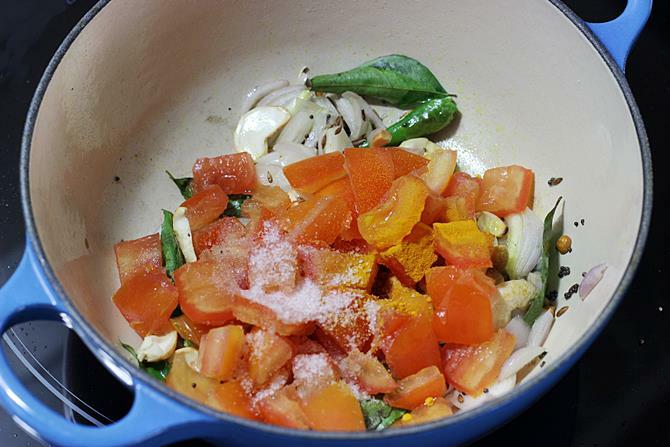 While roasting the rava, slice onions and chop tomatoes and green chilies. 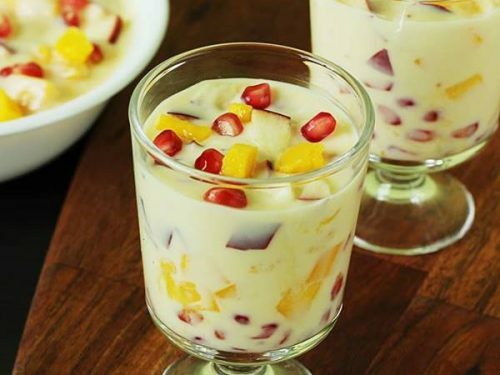 Set the rava aside preferably to a bowl for easy pouring. 2. Heat oil or ghee in the pot. Ghee lends a good flavor to this tomato upma. 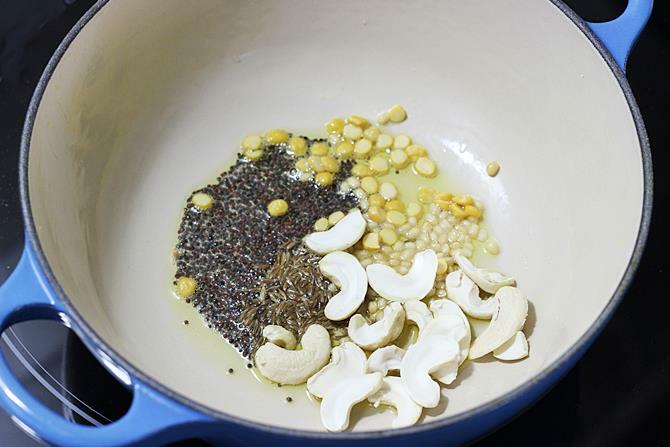 Add mustard, cumin, chana dal, urad dal and cashews all at one time. Saute until the dals turn golden. 3. 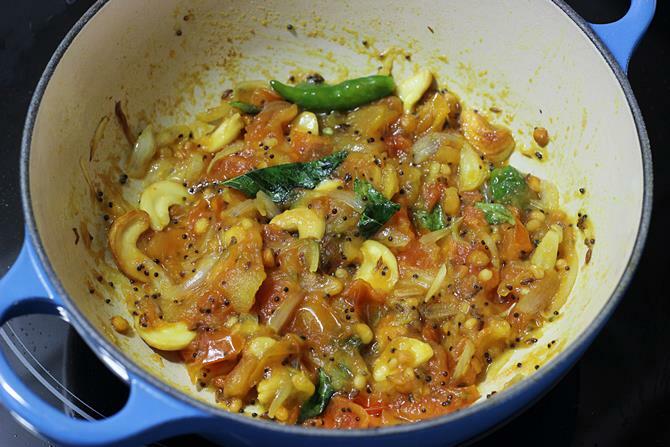 Add curry leaves, green chilies and onions. Saute until the onions turn slightly pink. This takes about 1 to 2 mins. 4. 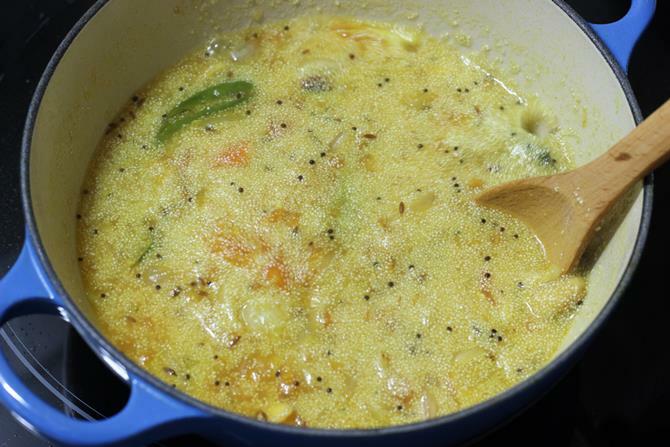 Next add tomatoes, turmeric and salt. Saute for 1 to 2 mins. 5. Cover and cook until they turn mushy & completely soft. 6. Saute for another minute on a high flame, this enhances the flavor of tomatoes. 7. Add water, stir and check the salt. The water must be slightly salty. Bring it to a boil. 8. Reduce the flame to medium. Slowly pour rava in a stream to the boiling water. While you pour stir the water to prevent lumps of rava. 9. 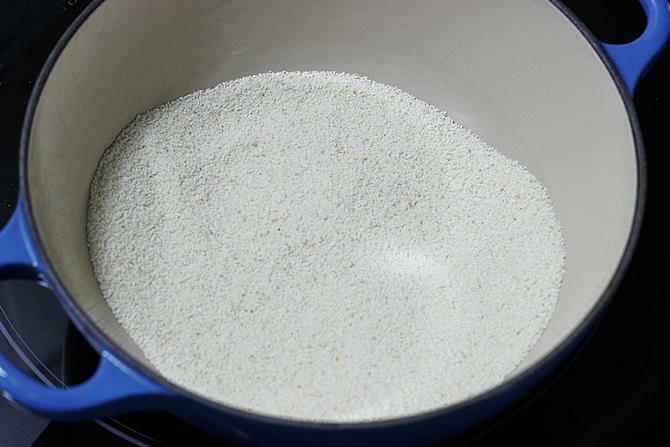 Quickly stir once to make sure no lumps have formed. 10. 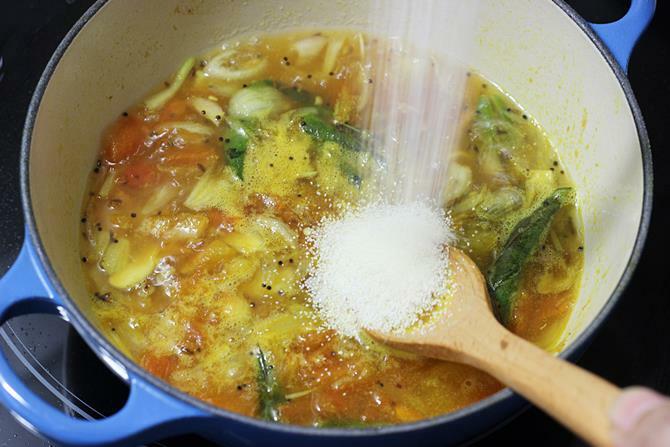 Cover and cook until the moisture is absorbed. 11. Stir well. 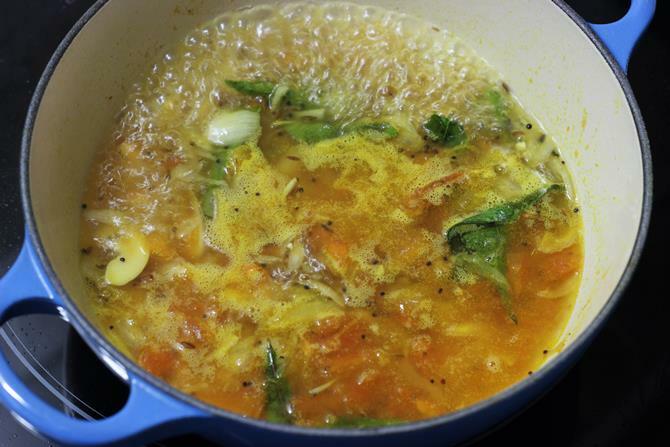 Switch off and add coriander leaves. 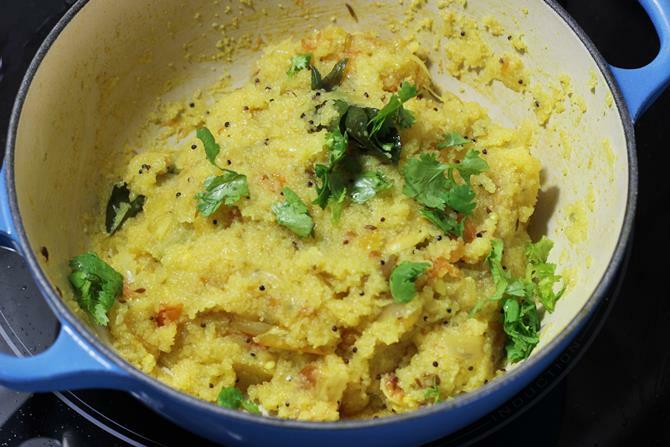 Grease a bowl with ghee and scoop the upma to it. 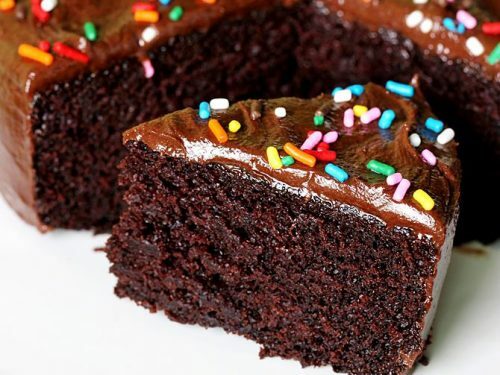 Press down evenly with a spoon. Invert it on a plate and shake off gently. Garnish tomato upma with cashews and coriander leaves. Serve hot or warm. 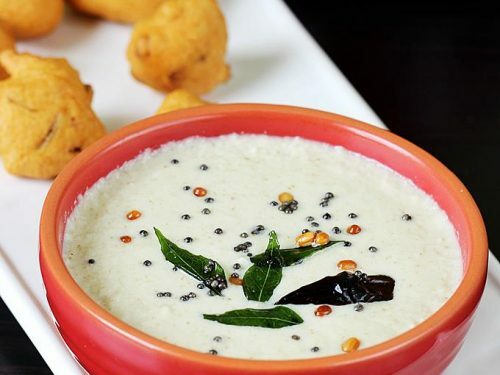 I’m a beginner, which kind of Sooji to use for upma ? In USA, they have fine, coarse, medium.. I’m confused? !.And also what these types of sooji used for? 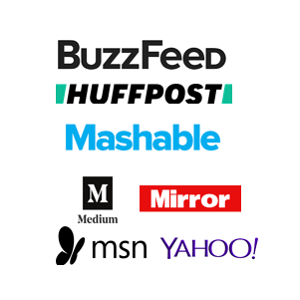 You can use any of these to make upma. But fine suji is the one I have used in this post. All your recipes , whether it’s drumstick and potato curry, mutton curry , tawa pulao , tomato upma , rava uttapa to just name a few are absolutely delicious.Thanks Swasthi for teaching me to cook , I was making many mistakes before but now my husband and children just polish the plates clean. Thanks a lot for the wishes. I miss this so much in Canada, Upma was my daily breakfast which kept full all day long. Now I buy some breakfast from oceanpalate Indian breakfast though; but thanks for the step by step procedure Il make this my self but on a holiday! Yes do try it on a weekend.